An Arab bus driver was assaulted with rocks in the Negev by a 27-year-old Israeli on Saturday afternoon, a Ma'an reporter said. Then the bus driver went inside his bus and called the police who told him to stay inside and shut its doors. 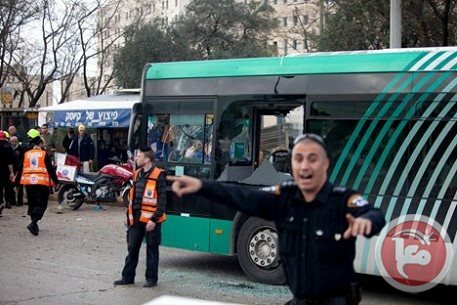 An Israeli police vehicle arrived and pursued the suspect, who was identified by the bus driver’s description. The suspect was caught and taken to a police station for investigations. 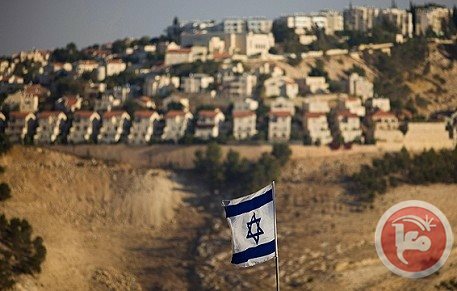 Israeli settlers from settlements in the Tuqu village in southern eastern Bethlehem took over lands belonging to the al-Shaer and al-Umour families on Saturday. Taysir Abu Mifreh, head of Tuqu town council, told Ma'an that a group of settlers protected by soldiers took over al-Shaer and al-Umour lands, over 100 dunams, near a settlement in eastern Tuqu. Abu Mifreh highlighted that settlers set up four caravans in the Thahr al-Kharrubah area next to the illegal Roman outpost in order to expand it and turn it into a settlement. He called upon all official and concerned parties to intervene to protect the areas near the settlement. At least six Palestinians were injured during clashes that broke out Friday night between Israeli occupation forces (IOF) and Palestinian youths at the northern entrance of Bethlehem. Two arrests were also reported in the city. According to the PIC reporter, the injured citizens were transferred to hospital for treatment where medical sources said that 3 of them were shot with live bullets. In a related incident, dozens of trees were completely burned when IOF soldiers heavily fired flare bombs while storming Asakra village, west of Bethlehem. Three citizens were arrested after raiding and searching their homes. Local sources pointed out that Israeli forces’ break-in came shortly after Palestinian youths throw Molotov Cocktails at settlers’ cars passing near the village. An Israeli settler had earlier run over a 17-year-old boy, from Bethlehem, before fleeing the scene. The boy was transferred to hospital after suffering moderate injuries. In al-Khalil, three Palestinian youths were injured after the outbreak of violent clashes in Surif town, west of the city. The clashes broke out after Palestinians took to the street in protest against the establishment of a new outpost on part of the town’s land. Teargas, sound bombs and rubber bullets were fired during the clashes, local sources revealed. 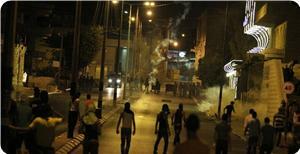 On the other hand, violent clashes erupted at the entrance to Fawar refugee camp in al-Khalil. Palestinians stoned Israeli soldiers during the clashes protesting Israeli continued attacks in occupied Jerusalem and the West Bank. IOF soldiers fired tear gas and sound bombs at the protesters. Many suffered breathing problems after inhaling the teargas. A number of fanatic Israeli settlers attacked, on Saturday, a Palestinian man in the southern West Bank city of Hebron, and violently beat him, inflicting moderate injuries. The attack took place in the Sha’aba neighborhood, in Hebron city. The wounded Palestinian, Bashir Sobhi al-Mohtaseb, 30, was moved to the al-Ahli Hospital in the city, suffering various cuts and bruises. The WAFA News Agency quoted Palestinian residents of the area stating that the settlers came from the Keryat Arba’ illegal settlement, east of Hebron city. 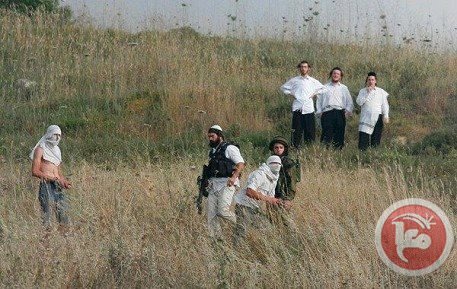 Late on Friday at night, a number of fanatic Israeli settlers kidnapped a young Palestinian man from Osarin village, south of Nablus, stabbed and beat him nearly to death. Initial autopsy reports reveal that 16-year-old Muhammad Hussein Abu Khdeir died due to burns and other complications resulting from the fire. General Palestinian Prosecutor, Mohammad Abul-Ghani al-Oweiwy, attended the West Bank autopsy after body was handed over to a medical team. Forensic studies found chars in the lungs, indicating that Muhammad was still breathing while he was being burned, according to WAFA. 90% of the child's body was burned, varying from 1st to 4th degree in severity. 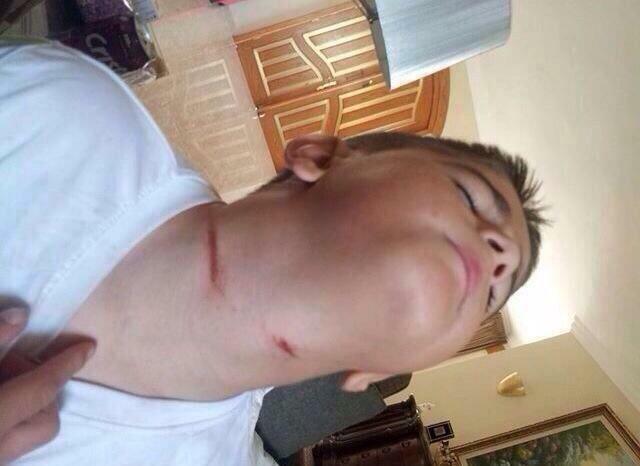 The child was also beaten on the head, as signs of beating and concussion were clear. The Palestinan Forensic Center has taken samples and tissues from the body, to be submitted for further analysis before a final detailed report can be revealed, according to Arabs48. 16-year-old Muhammad Hussein Abu Khdeir was abducted from outside his home, in the Shu'fat district of occupied East Jerusalem, by a group of Israelis who forced him into a car and sped off. The teen’s burned body was found hours later in a vacant lot in another part of the city, sparking protests in his home neighborhood which are ongoing at the time of this report. Over 200 Palestinians have been injured by Israeli army fire in ongoing clashes with Israeli soldiers, in different parts of occupied Jerusalem and nearby towns, following the abduction. 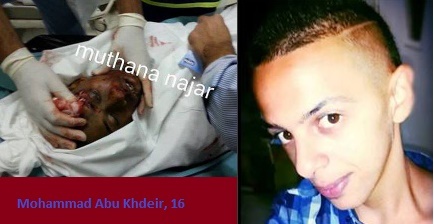 His funeral was held today [July 4, 2014], amidst further clashes with Israeli forces. A preliminary autopsy report shows that 16-year-old Muhammad Abu Khdeir was burnt alive by his kidnappers, a senior Palestinian official said late Friday. Attorney General Muhammad Abd al-Ghani Uweili told Ma'an Abu Khdeir's autopsy showed soot in the victim's lungs and respiratory tract, indicating he was alive and breathing while he was being burnt. 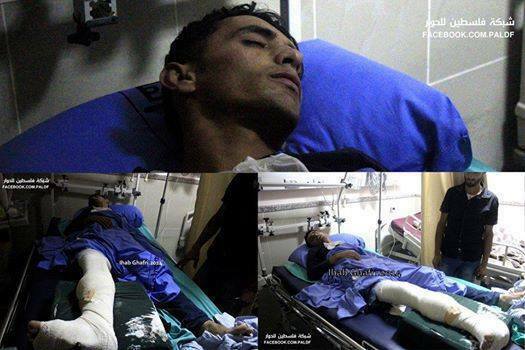 Abu Khdeir also had a head injury, but died from complications as a result of being burnt, Uweili said. A final autopsy will be released later, he added. The autopsy was conducted at Abu Kabir Forensic Institute in Israel in the presence of Palestinian coroner Dr. Sabir al-Aloul, the director of the Institute of Forensic Medicine at al-Quds University. Palestinians say right-wing Israelis kidnapped and killed Abu Khdeir, whose body was found early Wednesday in a forest near West Jerusalem. The murder is thought to be a revenge attack in response to the kidnapping and killing of three Israeli teens, who were buried the day before. Israeli police say the circumstances behind Abu Khdeir's killing remain unclear. 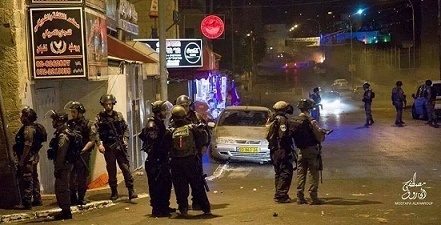 Palestinian medical sources in the northern West Bank city of Nablus have reported that a number of fanatic Israeli settlers kidnapped, late on Friday at night, a young Palestinian man from Osarin village, south of Nablus, and beat him nearly to death in addition to stabbing him. The setters kidnapped Tareq Ziad Odeily, 22, after two settler vehicles invaded the village, forced him into one of their cars, and drove away. The settlers first sprayed his face with pepper-spray, the Raya News Agency has reported. He was then taken to an isolated area, where he was repeatedly beaten, kicked, punched and stabbed before the settlers fled the scene, leaving him severely bleeding, apparently believing he will die of his wounds. Using his mobile phone after the settlers left the scene, while barely able to speak or move, Odeily managed to call his father, informed him of what happened, and where he can find him. Dozens of local youths and medics then searched the area, and located Odeily, before he was moved to the Rafidia Hospital in Nablus suffering serious injuries. Shin Bet has admitted their failure to come up with any positive conclusion regarding the whereabouts of the alleged ‘abduction’ of the three Israeli settlers in Hebron. According to Al Ray, Israeli journalist Ben Caspit quoted an official from the Israeli security service as saying that they failed in its mission to find the abductees and that an operation should have been frustrated in its infancy. “It’s about two young men who were held in Israeli prisons in the past and should have been well under surveillance before the operation," he said. Three Israeli teens, one said to be holding US citizenship, were reported missing late on Thursday, June 12, somewhere between Gush Etzion settlement bloc and the Alon Shvut settlement. In the weeks that followed, Israel launched an extensive and continuing series of arrest raids and military assaults across the West Bank and the Gaza Strip, in which over 600 Palestinians, including political officials were arrested, aorund 170 of which were placed under administrative detention, without charge or hope for a trial. The bodies of the three missing settlers were uncovered near Halhoul, north of Hebron, over two weeks later, in a field not far from where they reportedly went missing. Hundreds of Palestinians have been injured in ongoing clashes, since the bodies tuned up. Thirteen Palestinians have been killed since June 12. From the first reports of the alleged abduction, Israel quickly pointed to Islamist political faction Hamas in naming a target suspect. Hamas has persistently denied the accusations and evidence to suggest that Hamas or any other Palestinian group or individual was behind the teens' disappearance has never been presented. "This operation was not the result of chance, it took long to plan for," the official was further quoted as saying. Five Palestinians were injured in clashes that broke out in Sureif village northwest of Hebron on Friday, activists said. Spokesman for the popular resistance committee Mohammad Ayyad Awad said two were shot with live bullets in the feet, three were injured with rubber-coated steel bullets, and others suffered excessive tear-gas inhalation. 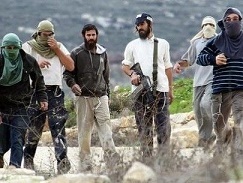 Clashes erupted after Israeli settlers started building a new outpost in the village, Awad added. Dozens of settlers installed, on Friday, a number of illegitimate settlement outposts, on Palestinian lands in the Bethlehem district, and in Hebron in the southern part of the occupied West Bank. Head of the Teqoua’ town council east of Bethlehem, Taiseer Abu Mfarreh, stated that a number of settlers, of a nearby illegal outpost, installed four mobile homes on Palestinian lands, east of Teqoua’. Abu Mfarreh stated that the settlers are trying to expand their outpost, adding that the settlers try to add more mobile homes year, the WAFA News Agency said. 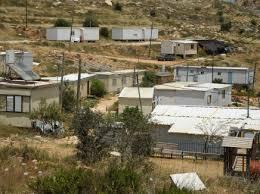 In Surif, near Hebron, a number of settlers installed mobile homes, west of the town. Head of the Surif town council stated that settlers from Beit Ayin illegal outpost, installed on Palestinian lands, brought a number of mobile homes on lands belonging to residents from Surif and al-Jab’a nearby village. Meanwhile, the official Israeli Radio said the Israeli government has decided to build a new neighborhood in the Keryat Arba’ settlement, in Hebron city, in addition to two outposts in Gush Etzion settlement bloc, WAFA said. 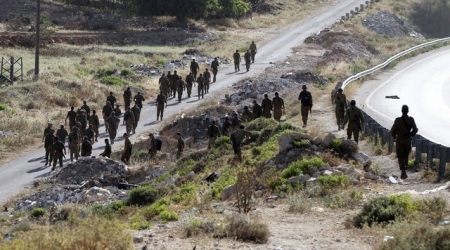 Israeli settlers set up outposts early Friday in northern Hebron, an official said. The secretary of the Palestinian National Initiative in the town of Surif in northern Hebron told Ma'an that locals found settlers, protected by Israeli soldiers, setting up an outpost on the al-Jreinat mountain between Surif and Jabaa Friday morning. Shihada Hmeidat said that at 2 a.m. he heard the sounds of Israeli bulldozers and vehicles that were digging until morning. Settlers set up six caravans on the top of the mountain. Hmeidat said that this outpost is an extension of the Gush Etzion settlement near Surif, after the Israeli minister of defense ordered building more settlements. 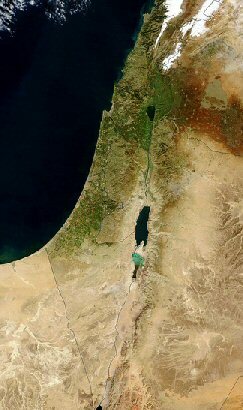 The lands on which the outposts were set up belong to the al-Ghneimat and al-Hur families. Violence by Israeli soldiers and settlers against the Palestinian community continued across the region, today, beginning with 20 reported kidnappings by occupying forces in the West Bank. At least 640 Palestinians have been arrested since the beginning of Israel's recently escalated arrest campaign. Israeli forces, today, abducted around 20 Palestinians, including minors, in predawn raids across the West Bank and Jerusalem, according to reports by local, media and security sources. In the Hebron district, seven people were taken by Israeli forces, including three children between the ages of 8 and 10, under a pretext of throwing stones at soldiers. According to WAFA Palestinian News & Info Agency, the children were released later in the day, after the Palestinian Liaison Office intervened. In the nearby village of Beit Ummar, 3 more Palestinians were kidnapped and another was taken at the ‘Atzion’ checkpoint, following a beating in the head by soldiers with their rifle butts. In Jenin and its nearby refugee camp, soldiers invaded the area, abducting one local resident, age 29, after raiding his house and wrecking his furniture. Soldiers turned several homes them into military outposts for hours in the camp, as well. The invasions led to violent confrontations with local residents, causing several cases of suffocation as soldiers fired tear gas canisters, stun grenades and live bullets. In Qalqilya, three Palestinian residents, including a member of the Palestinian Legislative Council, were kidnapped by soldiers who both stormed the city and the nearby village of Kafr Qaddum. Many other homes were raided in the nearby village of Azzoun, where soldiers tampered with their contents. No further arrests were reported. In Tulkarm refugee camp, Israeli forces took with them a local resident after invading his home in the late night hours. Additionally, one Palestinian youngster was kidnapped after soldiers stormed his house in the village of Hazma, Jerusalem Governorate. Meanwhile, army forces abducted five Palestinians, including four ex-detainees, in both Nablus and in the nearby al-Ein refugee camp, as well as the villages of Qaryout and Madama. Futhermore, forces again stormed Awarta village, where they raided a house; no arrests were reported. Attacks by Israeli settlers continued today as Arab students attenfing the College of Safed, in the Upper Galilee were subjected to threats by Jewish fellow students belonging to right-wing parties and religious groups in the college. Arab MK, Massoud Ghanayim, reported that he had received letters from Arab students in demand of his intervention in stopping the attacks against them, explaining that they were exposed to attempts of assault following the kidnapping and killing of the three settlers, WAFA reports. Ghanayim then sent urgent messages to the Israeli Defense Minister and the Minister of Education and Chairman of the Faculty of Safed, requesting security and protection for Arab students. Just today, an Israeli settler got out of his car and opened fire, with a pistol, at one Ali Abu-Samra, age 30, near ar-Ram town, northeast of Hebron. Ali was injured in the foot by the shot. The settler reportedly fled the scene, following the incident. In Jerusalem, A 46-year-old Palestinian, from the town of Halhoul, where the 3 missing settlers were uncovered, reported that he was nearly kidnapped by three Israelis, early this morning. Ammar Abu Asbeh, 46, told WAFA that a car carrying three Israelis pulled in front of him while he was at Shaftai Israel St in Jerusalem, asking him for his identity card. Upon his refusal, they pushed him into car and fled the scene, but he was later able to open the door and escape. He was currently at an Israeli police station, at the time of the report. Israeli settlers attempted to kidnap a seven-year-old Palestinian child in the Jerusalem neighborhood of Beit Hanina overnight Thursday, locals said. Witnesses told Ma'an that four settlers from Pisgat Zeev tried to kidnap Muhammad Ali al-Kiswani while he was playing in the neighborhood late Thursday after breaking the Ramadan fast. Children in the area alerted family members, who thwarted the attack, according to witnesses. The settlers fled on foot, locals said. An Israeli police spokesman could not be reached for comment. On Tuesday, Muhammad Abu Khdeir, 16, was kidnapped from the Shufat neighborhood and later found dead in a Jerusalem forest. His body was found badly burnt. 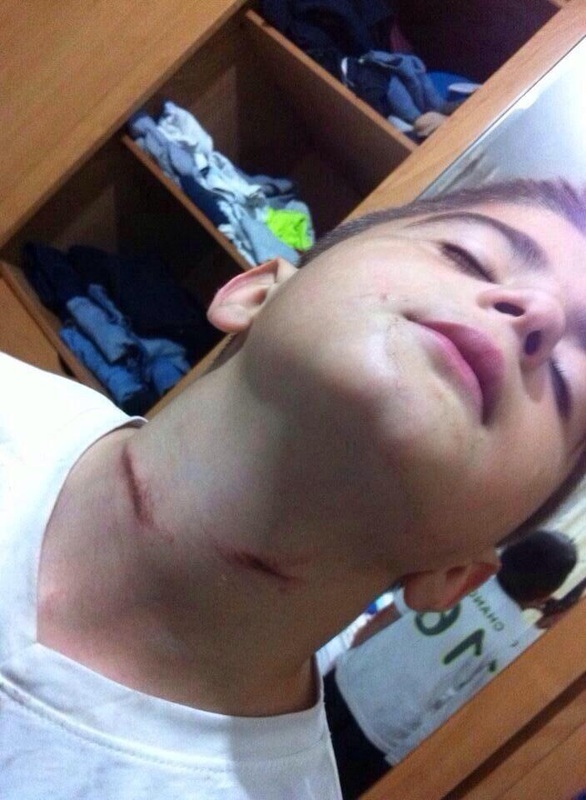 Earlier, two settlers attempted to kidnap Mousa Zalloum, 10, in Beit Hanina, locals said. The kidnapping was reportedly thwarted by the boy's mother and local residents. Palestinian sources in occupied Jerusalem have reported that the clashes and confrontations between Israeli occupation soldiers have been ongoing, while hundreds Palestinians have been wounded since a number of extremist settlers abducted a murdered a Palestinian child in occupied Jerusalem, Wednesday. The clashes have been taking place in several Arab neighborhoods and towns in the occupied city, especially in the neighborhood of Shu’fat, where the Palestinian child Mohammad Abu Khdeir, age 16, was born and lived until his abduction and murder, on Wednesday evening. Medical sources said undercover forces of the Israeli army kidnapped six Palestinians in Shu’fat, assaulted and dragged several Palestinians, after soldiers infiltrated the neighborhood and fired rounds of live ammunition, wounding several Palestinians, including Tareq Salah Abu Khdeir. Salim Mousa Abu Khdeir and Amer al-Lifftawi. The clashes extended from the Shu’fat neighborhood, to Beit Hanina nearby neighborhood, while medical sources said at least eight Palestinians were shot with rubber-coated metal bullets, mainly in the head and upper body parts. Eyewitnesses said that, shortly after midnight, dozens of Palestinian youths surrounded a Palestinian home that was illegally taken over by fanatic Israeli settlers two years ago, and were attacked by more than 25 undercover soldiers who were hiding in the home. The youths managed to torch the main door of the home, and some of its windows. 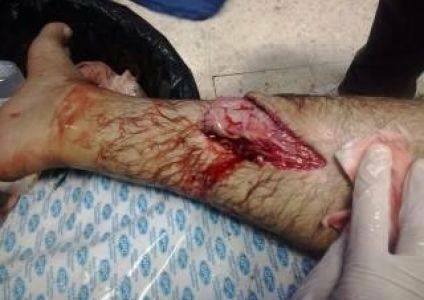 Four more Palestinians have been wounded in Shu’fat refugee camp, while soldiers kidnapped two Palestinian children. One Palestinian was moved to a local hospital after a soldier fired a gas bomb directly at him. Several Palestinians were injured by live rounds at the Anata town junction, and more than twenty Palestinians were injured by rubber-coated metal bullets and concussion grenades. Two of the wounded Palestinians suffered head injuries after being hit by rubber-coated metal bullets, and were moved to a local hospital. Clashes also continued in the at-Tour neighborhood, Silwan, Ras al-’Amoud and the al-Eesawiyya town in occupied Jerusalem. In addition, one woman was shot in the back by a rubber bullet as she was standing in front of her home. Local youth threw stones and Molotov cocktails at dozens of invading soldiers, who fired rounds of live ammunition. At least ten Palestinians have been injured in the al-‘Eesawiyya town, after the soldiers invaded it, while resident Aisha Hamdan, 60 years of age, suffered a broken leg after she was hit by a concussion grenade, fired by the soldiers at her. Hundreds of soldiers have also been deployed in areas separating between the French Hill, the Hebrew University and the Hadassah Hospital, in order to prevent the protesters from entering those areas, where they fired several rounds of live ammunition at them. In al-Ram, at least three Palestinians have been wounded, while undercover forces of the Israeli military kidnapped at least three more Palestinians. In addition, soldiers kidnapped three Palestinians in a number of neighborhoods in the Old City of occupied Jerusalem. One Palestinian, identified as Nidal Amin Shqeirat, 33, suffered various cuts and bruises after being violently assaulted and beaten by Israeli soldiers in Jabal al-Mokabber. The soldiers prevented a Palestinian ambulance crew from reaching him, an issue that led to further clashes. Meanwhile, dozens of extremist Israeli settlers attacked the Mamanallah Mall, chanting slogans, including “Death To Arabs”, and “Revenge” before trying to attack Palestinian workers and residents. The police arrived at the scene and forced the settlers out, but did not arrest any of them.